This palatial extravaganza of a building sits on the main road from Stowmarket on the edge of the large village of Bacton. It is a reminder that villages and parishes are not the same things that this church is in the parish of Cotton, not Bacton, which starts on the other side of the road. 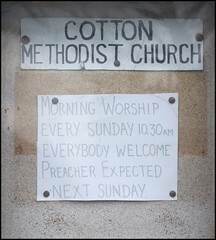 And so, despite the fact that Cotton village is a mile or so off, this is Cotton Methodist Church, not Bacton Methodist Church. The building suits the busy road. 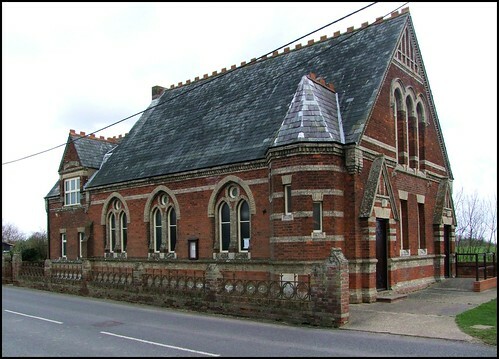 It is urban in feel, and would not look out of place in the suburbs - indeed, it is very similar in style to the Methodist People's Hall on Stoke Street in Ipswich. The walls are banded with red and white brick, and the windows are in the transitional plate tracery style of the late 13th century, when Early English was becoming Decorated. There are two main entrances to the south of the building, which form the main frontage. 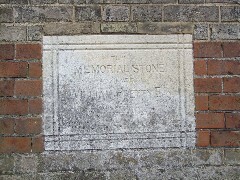 Probably due to the car fumes, the foundation stone is now rather indistinct, but the year 1877 can still be made out, and this was when William Pretty, owner of the main Ipswich department store, declared the building open. We have already met him on a memorial stone at Alan Road Methodist Church in Ipswich. The Methodists had an earlier chapel, although it is not clear to me if it was on the same site. It had been built in 1814, and on the afternoon of the Census of Religious Worship in 1851 it could claim a congregation of 260, compared with the 77 who attended the Anglican parish church. This adherence to non-conformism was a feature of Suffolk life in the middle years of the 19th Century. Methodism is, perhaps, an enthusiasm which is now passing from us, but with the lively and burgeoning Baptist churches which you seem to find in almost every larger Suffolk village, it is to an extent also true today.